In our ongoing making-it-move coverage (previous episode here) now the thermoresponsive microjet as reported by Magdanz here. We have seen hydrogen peroxide / metal / vesicle based micro-swimmers before but the dimension added is on-demand weaponisation. Key is the vesicle construction material. It consists of a polymer bilayer of poly(N-isopropylacrylamide-4-acryloylbenzophenone) (PNIPAM-BA) dip-coated with polycaprolactone. This film was cross-linked by irradiation across a photo-mask, uncross-linked material was rinsed off and finally a platinum layer was added by sputter coating. The resulting trilayer reversibly folds into 30 micron diameter tubes and unfolds again below and above 28°C in water by a process of swelling and unswelling. In a hydrogen peroxide solution at low temperatures the tubes behave as microjets propelled by oxygen bubbles. Increasing the temperature above 28°C makes the tubes unfold and the movement stops. As reported back in 2012 here chemical company Sanofi and the Bill and Melinda Gates Foundation have joined forces (Sanofi the know-how and Bill the money) to increase production of the important antimalarial drug artemisinin. In a recent OPRD publication Sanofi chemists present a commercial-scale (no-loss no profit) production line with a capacity of 60 tonnes, starting from yeast-produced artemisinic acid. Here is the summary. 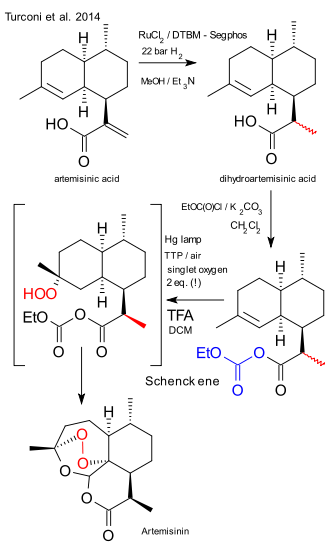 In step one from artemisinic acid to dihydroartemisinic acid (a dehydrogenation) the Wilkinson catalyst was deemed too expensive and replaced by ruthenium chloride (R)-DTBM-Segphis (a modified segphos). Scale: 600 Kg, 90% diastereoselectivity. The compound was next activated with ethylchloroformate and potassium carbonate in dichloromethane to the anhydride. The photochemical step consisted of adding tetraphenylporphyrin as a sensitizer and trifluoroacetic acid in dichloromethane. The subsequent Schenck ene reaction / Hock rearrangement requires two equivalents of singlet oxygen. Where the prior art yielded 41% of product, this photochemical solution pushes out 55%. Side note: the article does not really explain why the acid was activated, the Seeberger procedure does not include this step. Remaining challenge: product isolation was accomplished by simultaneous DCM distillation - solvent replacement with n-heptane and crystallisation. Pretty amazing when considering this is still industrial production at the hundreds of kilogram scale and the final product is a labile peroxide! Please do admire the photochemical reactor pic embedded in the article. At the Sanofi plant in Garessio (Italy) it is Christmas every day of the year. Thanks to tetrahedral carbon the number of possible molecules that can exist seems infinite. Any child can take a piece of paper and draw a completely unique molecule on it and name it after itself, sticking to the basic rules of valence, multiple bonding and some common sense with regard to cluttering. Synthesising the molecule in question is of course another matter. Can a molecule therefore be rare? No. Yang Xiao et al. in a recent publication however seem to differ, they titled it "Regioselective Electrosynthesis of Rare 1,2,3,16-Functionalized Fullerene Derivatives". Nothing wrong with the publication itself: a fullerenoindole (itself the adduct of fullerene and an aniline) was electroreduced and the dianion subjected to benzyl bromide. The benzyl group ended up exclusively at the 16-position and a proton (derived from stray water) at the 3-position. Congratulations on the regioselectivity achieved but obtaining a "rare" molecule by decorating a fullerene with any number of substituents is not an accomplishment. If the reaction was not regioselective at all you would have ended up with many more "rare" molecules. Let's reserve rarity to animals uncovered by biologists in remote parts of the world or a Da Vinci painting. "Rare" has no business in chemistry.